In a study published in Archaeological and Anthropological Sciences, Dr Peter Guest and Dr Richard Madgwick of the University's School of History, Archaeology and Religion, used biochemical techniques of animal remains to reveal the origin of livestock supplied to the legionary fortress at Caerleon. While the majority of livestock are consistent with origins in the local area, analysis found that at least one quarter of the pigs, cattle and caprines (sheep/goats) originated outside southeast Wales, some from southern or eastern England while others could have come from as far away as southern Scotland or northern France. Senior Lecturer in Roman Archaeology Dr Peter Guest, who led the latest discoveries at Caerleon - Britain's only undisturbed Roman legionary fortress, said: "Provisioning large concentrations of professional soldiers in Britain after the invasion in AD 43 was a major challenge for the Roman Empire. For the first time we can see that the invaders were sourcing livestock both locally and from considerable distances. How these supply networks operated remains unclear, but this study has important implications not only for understanding how the Roman army was sustained in Britannia but also the impact that provisioning the army had on the countryside, particularly around military sites." 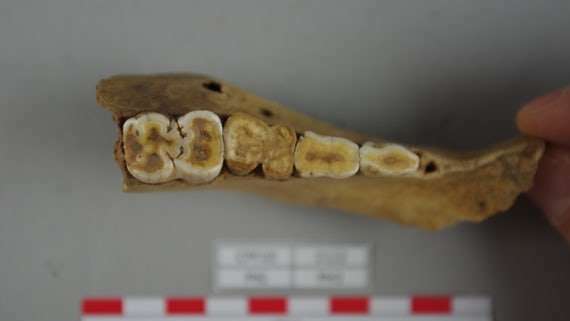 Osteoarchaeologist Dr Richard Madgwick added: "As the first study to use biochemical data to investigate the supply of animals to the Roman army in the provinces, it is hoped that these results will encourage further isotope studies of husbandry practices and livestock supply in Roman Britain. The research adds important data to the very limited corpus for domestic animals in Roman Britain, providing significant new information on the production, supply and consumption of cattle, sheep/goat and pigs at a key military base." 'On the hoof: exploring the supply of animals to the Roman legionary fortress at Caerleon using strontium isotope analysis' is published in Archaeological and Anthropological Sciences.